Saint David the Dendrite of Thessaloniki (†540). 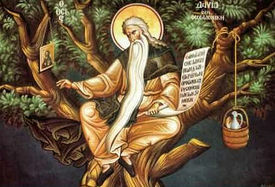 Our Venerable and God-bearing Father David of Thessalonica, also David the Dendrite ((Greek): Ὁ Ὅσιος Δαβὶδ ἐν Θεσσαλονίκη) circa 450 AD - 540 AD, was a renowned ascetic and blessed fool of Thessaloniki, in Byzantine Greece who lived as a dendrite for three years, in a form of asceticism similar to that of the Stylite saints. Saint David came from Northern Mesopotamia, which was a great monastic center, and was born around 450 AD. For reasons not mentioned, he travelled to Thessaloniki together with the monk Adolas. Although we do not know why either David or Adolas traveled from Mesopotamia to Thessaloniki, both the Synaxarion of Constantinople and the Menologion of Emperor Basil II assure us that he did come from somewhere in the "east". At the end of the three years an angel of the Lord appeared to him, assuring him that his prayers had been heard, and that the period of his trial as a dendrite had ended. The angel instructed him to descend from the tree, and continue the ascetic life in silence in a cell, continuing to laud and bless God. He was foretold by this same angel that he would "accomplish one other act of love" before he died. Thus Saint David came down from the almond tree and entered a cell that had been prepared by his disciples. Saint David entered his cell in the presence of Archbishop Dorotheos of Thessaloniki (c.497-c.520) along with many pious clergy and faithful who gathered to see this momentous event when the news had spread. Living as a recluse in his cell and for his unparalleled ascetic feats, this Saint was considered as an angel of God by the people. Many people came to seek his prayers and many healings of demonic possession, diseases and suffering are reported. In one such case, we are told a certain youth had a demon and came to the cell of the Righteous David crying out: "Release me, O David, thou servant of the eternal God, for fire comes forth from your cell and burns me." Upon hearing this David reached out his hand from his cell through a small window and held the youth, saying: "Our Lord Jesus Christ, the Son of the living God, commands you to go forth from His creature, O unclean spirit!" After doing the sign of the Cross over the youth, the demon was immediately released and all marvelled glorifying God who glorifies those who please Him with God-pleasing works. Saint David's silence was interrupted sometime after 520 when Archbishop Dorotheos died. His successor, Archbishop Aristeides, together with a multitude of clergy and faithful came to the Saint's cell pleading that he travel to Constantinople so as to entreat Emperor Justinian (527-565) regarding the establishment of Justiniana Prima as the new capital of the Prefecture of Illyricum replacing Thessaloniki. [note 7] Archbishop Aristeides was against this, since it would demote the status of Thessaloniki and divide Illyricum. Aristeides could not travel to Constantinople because he did not want to leave the city shepherdless with the impending threats of the barbarians. David submitted to the pleadings of the Archbishop and the people of Thessaloniki in order to fulfill the prophesy of the angel that appeared to him while on the tree and out of obedience to the bishop and the love of the people of Thessaloniki. After many years of seclusion he emerged from his cell and saw the sun for the first time in many years. His appearance had changed as well. His hair had grown to his lower back and his beard fell all the way down to his feet. Together with his two disciples, Theodore and Demetrios, they left during the night for Constantinople. The Saint returned by ship from Constantinople to Thessaloniki. However, when he arrived at Thermes at a place called Emvolos (about 126 stadia from the Saint's cell), he gave up his spirit to the Lord after making his request known to his disciples that he be buried at his monastery. This took place between the years 535–541 AD. The ship continued on to the port of Thessaloniki, but a strong wind escorted them as if by divine providence and landed at the spot where Sts. Theodoulos and Agathopodus (April 5) were martyred on the west side of the city. Upon hearing the news of his falling asleep, the Archbishop with a large crowd gathered to pay their last respects and by procession lead him up to the Monastery of Sts. Theodore and Mercurius where his relics were enshrined in a wooden coffin according to his wishes. About 150 years after the Saint's death, in 685-690, the abbot of the monastery Demetrios opened his tomb in order to receive a portion of his relics. In doing so however, the plaque on the tomb fell and broke into many pieces. This was seen by the abbot as a sign that it was not the wishes of Saint David for his relics to be portioned. A monk under Demetrios by the name of Sergius eventually became Archbishop of Thessaloniki. He was present when as a monk they had tried opening the tomb of the Saint. Honoring this occurrence, Sergius opened the tomb which emitted a beautiful fragrance from the incorrupt relics and took care to only remove some hair from the beard and head of the Saint in order to distribute to the faithful to increase their faith and help aid in their salvation. The tomb of the Saint remained undisturbed until the Fourth Crusade in 1204. In 1236 it was taken by Crusaders to Pavia, Italy and from there transferred to Milan in 1967. Finally on September 16, 1978 through the efforts of Metropolitan Panteleimon (Chrysofakis) of Thessalonica, the sacred relics of Saint David were triumphantly returned to Thessaloniki and housed in the Basilica of Saint Demetrios the Great Martyr. To celebrate this feast a Service was written by the renowned hymnographer Elder Gerasimos Mikragiannanitis. The image of God, was faithfully preserved in you, O Father. rather to be concerned about the soul which is immortal. Wherefore, O Holy David, your soul rejoices with the angels. where thou didst find that Tree which in Eden we lost of old. Remember us all, who keep thy memory. ↑ On September 16, 1978 through the efforts of Metropolitan Panteleimon (Chrysofakis) of Thessalonica, the sacred relics of Saint David were triumphantly returned to Thessaloniki from Milan, Italy. ↑ It was known as Koukouliaton because the monks wore hooded-cloaks, for which it was known, and which is depicted in the icons of the Saint. In fact in January 1944, a marble slab was found in the Jewish cemetery that depicted an icon of Saint David dating back to the 10th century, in which he is wearing a cloak with a hood hanging off his shoulders. ↑ The word "Aproiton" probably indicates the austere rule of the monasteries since it implies that the monks were not allowed to leave their monastery. This gate was probably located along the northern wall of the city to the west of the Acropolis which the Turks called Eski Delik during Ottoman times. ↑ However others say that the monastery was northeast of the Acropolis in an area known as the Garden of the Sheep. (Greek) "Δαυιβ ο βασιλευς και θεραπων του Θεου τριετῆ χρόνον ᾐτήσατο ἵνα δοθῇ αὐτῷ χρηστότης καὶ παιδεία καὶ σύνεσις, και ουτως μετα τριετῆ χρόνον εισηκουσεν ο Θεος της δεησις αυτου. δει καμε τριετῆ χρόνον καθισαι εν τω δενδρω τουτω, οπως ο κυριος μου Ιησους αποκαλυψη μοι και επιδη επι την ταπεινωσιν μου, και δωσει μοι σύνεσιν και ταπεινωσιν του δουλευειν αυτω εν φοβω και τρομω." ↑ It should be noted that although Saint David was the first ascetic known as a "dendrite" (one who lives in trees) in Thessaloniki followed by Adolas, this type of asceticism was practiced in places like Syria and Mesopotamia from which both David and Adolas came from (see the life of Saint Maro the Dendrite celebrated February 4th). 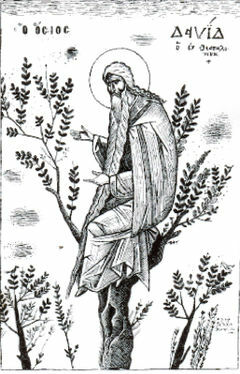 Furthermore, an interesting comparison of trees was depicted in the Church of Chora in Constantinople in the fourteenth century in which Saint David is shown at the entrance to the funeral chapel, and is positioned equidistant between Christ Calling Zaccheus (who had climbed a tree in order to see Christ as he passed through Jericho) and Moses before the Burning Bush. In each, we witness an encounter with the divine – Old Testament, New Testament, Roman Empire. In modern times, in the 1920's Saint Joseph the Hesychast lived in Athens and would pray sitting in a tree in imitation of the Saints. ↑ From 318-379 Sirmium was capital of the Prefecture of Illyricum which encompassed Pannonia, Noricum, Crete, and the whole Balkan peninsula except Thrace. Since 379 Thessaloniki became the capital of the Prefecture of Illyricum. Justiniana Prima was built in 535 in Serbia at the place of Justinian's birth. Justinian's Novel 11 announced the imminent transfer of the Illyrian prefecture to Justiniana Prima and the establishment of an Archbishopric there making it the Metropolis of Illyricum. Thus Eastern Illyricum was to be divided into two ecclesiastical regions under Justinian's law: the southern part belonged to the Archbishop of Thessaloniki and the northern was given autocephalous status under the Archbishop of Justiniana Prima. This was done in order to better protect the northern territories against the barbarians on the other side of the Danube. ↑ Though historians mention the fact that this division of Illyricum never actually took place, they tend to leave out the fact that this was because of the great impression Saint David had on Emperor Justinian. ↑ It should be pointed out here that the current Monastery of Hosios David in Thessaloniki has no association with the life of the Saint nor is it the site of the Monastery of Sts. Theodore and Mercurious. This is however the oldest monastery in Thessaloniki (only the Katholikon currently exists), and in Roman times it was known as the Monastery of the Prophet Ezekiel (some say Zachariah), though more popularly it is known as Latomou Monastery. This monastery was not named after Saint David until 1921, when it was returned to the Orthodox after serving as a mosque since 1430. ↑ Great Synaxaristes: (Greek) Ὁ Ὅσιος Δαβὶδ ἐν Θεσσαλονίκη. 26 Ιουνίου. ΜΕΓΑΣ ΣΥΝΑΞΑΡΙΣΤΗΣ. ↑ 3.0 3.1 Greek Orthodox Archdiocese of America - Online Chapel. David the Righteous of Thessalonika. Great Synaxaristes: (Greek) Ὁ Ὅσιος Δαβὶδ ἐν Θεσσαλονίκη. 26 Ιουνίου. ΜΕΓΑΣ ΣΥΝΑΞΑΡΙΣΤΗΣ. Greek Orthodox Archdiocese of America - Online Chapel. David the Righteous of Thessalonika. OCA - Feasts and Saints. Monkmartyr David of Thessalonica. The Prologue from Ohrid. June 26 - VENERABLE DAVID. Mystagogy: The Weblog Of John Sanidopoulos. Righteous David the Dendrite of Thessaloniki. This page was last edited on May 23, 2018, at 10:49.